Talk about knocking your socks off. 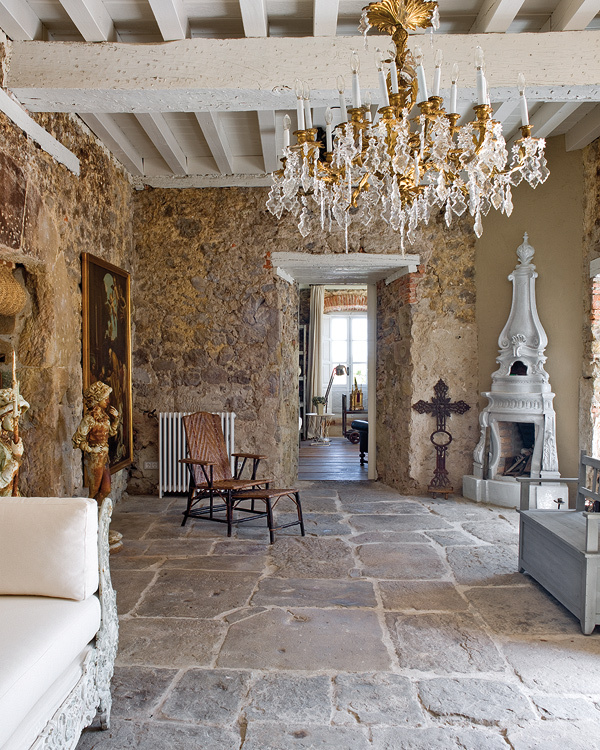 This amazing antique interior, located in Spain, is absolutely mind-blowing. Entering this space, is like being transported to another world, where creativity and antiquity reign. 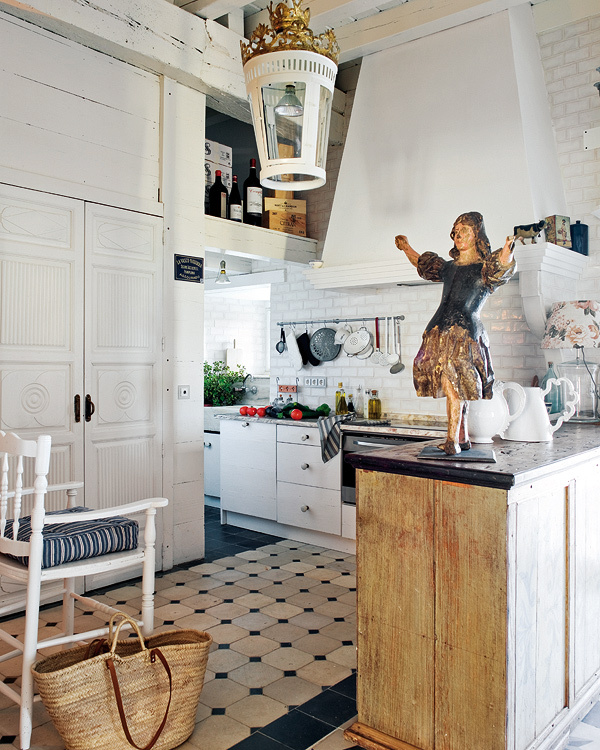 In the kitchen, an antique statue welcomes all visitors to the heart of the home. Large intricate double doors, tile flooring, natural woods, and white cabinets, fill the room. The chandelier is white with a gold antique crown and the countertops are granite. 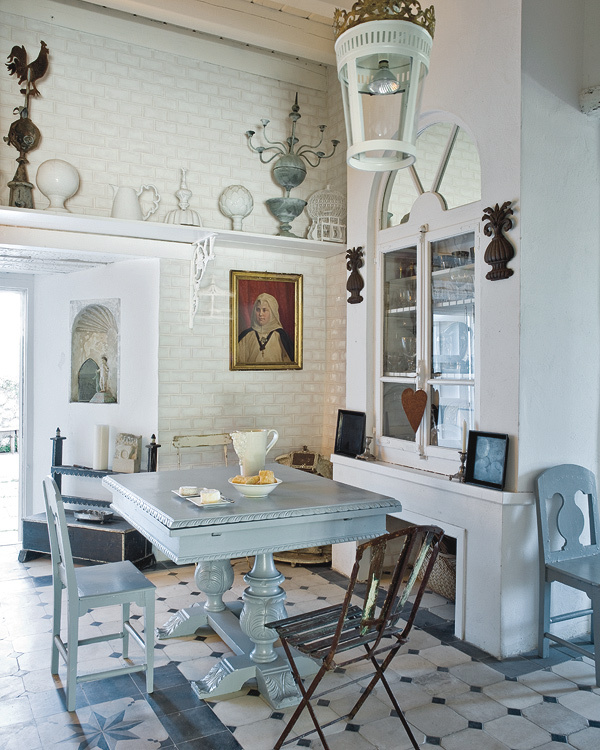 The antique sky blue table, is a wonderful centerpiece, with detailed legs, and matching chairs. Vintage pieces and sculptures line the long built-in shelf, near the top of the wall. The living room has a flagstone floor, stone walls, white wood beams, and a fantastic white fireplace. An opulent gold chandelier, hangs from the ceiling, adding a hefty amount of old-world glamour. 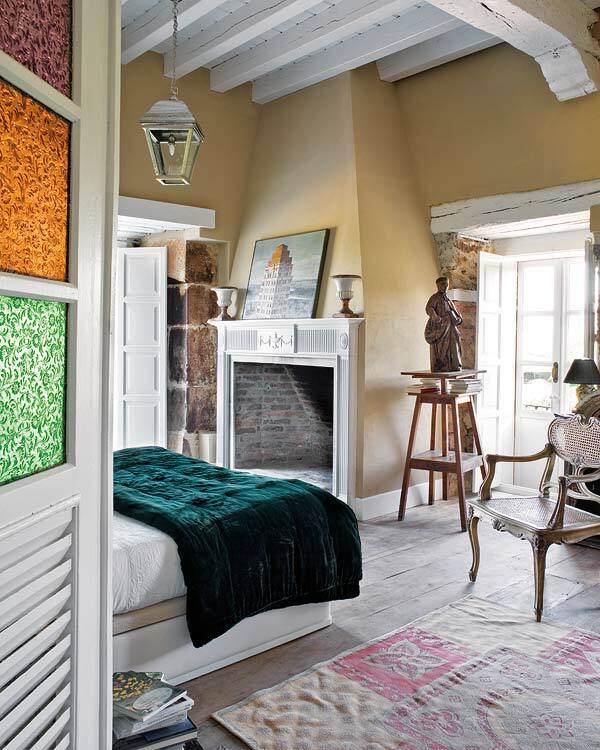 The antique interior in this room is one of a kind. The statues, large painting, and gold accents, generously add warmth and majesty. The bedroom has beautiful hardwoods, neutral colored walls, and a gorgeous white and brick fireplace. A bronze antique statue, sits between the balcony doors and the bed. The bedding is mainly white, with a luxurious green velvet bedspread. 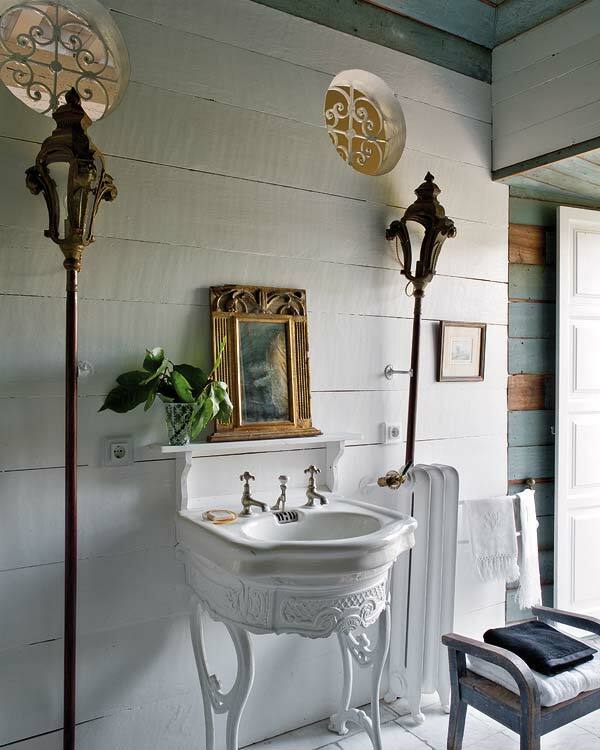 The bathroom in this antique interior is unlike any other. The antique French wrought iron sink, is accented by a beautiful artwork in a rich gold frame. Two antique lamps and two detailed circular wall cutouts frame the sink space. 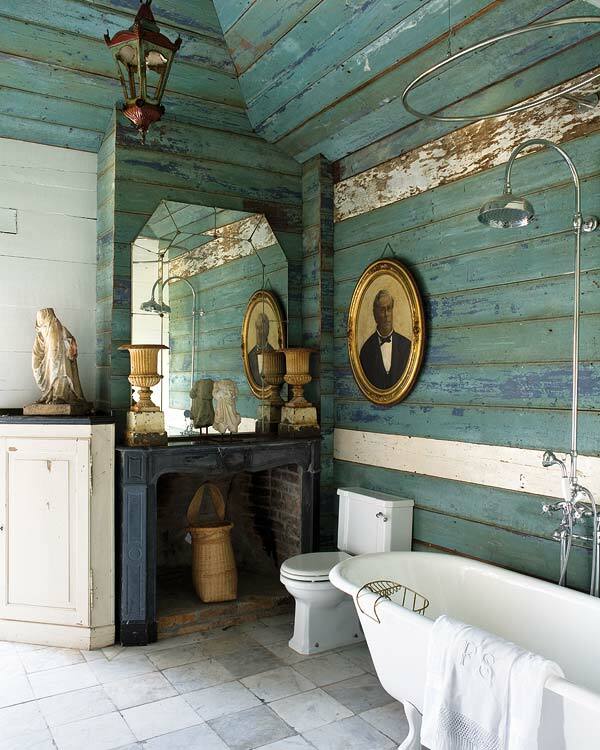 The wall by the beautiful claw foot tub, is a well-worn turquoise wood. This unique wall also has a little bit of blue and a little bit of white. Antique accents are used throughout this space, including the fantastic lighting and mirror. 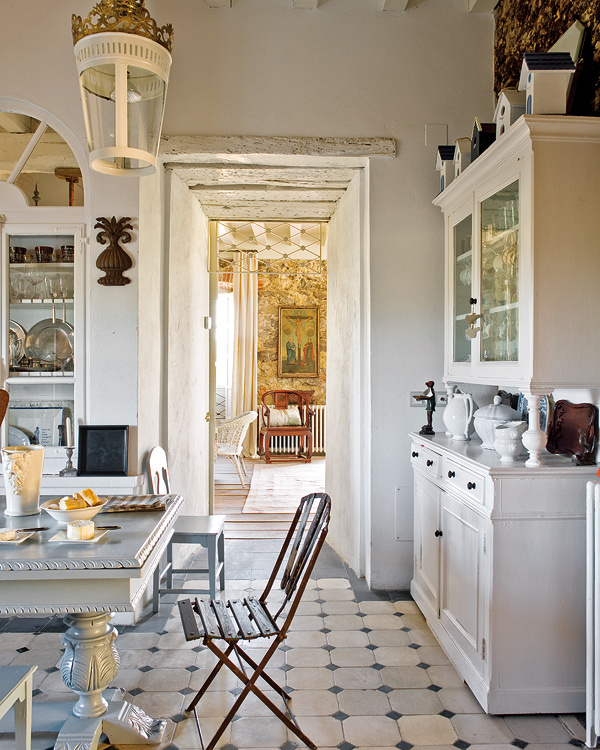 This antique interior is like another beautiful world. A gorgeously curated world, where imagination is welcomed with open arms.